Welcome to our site! The Cypress Point Homeowners Association is an intimate, guard gated, enclave of 81 custom homes nestled in far west Plano, Texas. No two homes in our community are alike, as they all have been custom designed and built by some of the area's top architects and builders. Cypress Point is a highly coveted place to call home for so many reasons. Our neighborhood is within the nationally acclaimed Plano Independent School District and is located in close proximity to some of the best private schools in the country. East-west access is an easy commute via the George Bush Turnpike and the north-south commutes are just as conveniently accessed via the North Dallas Tollway. Both of our major airports are less than a 30 minute drive away. In addition, Cypress Point is bordered by two clear-water spring fed streams and a beautiful lake. In fact, our resident swans are successfully raising a brood of elegant offspring. Our lake, streams, close proximity to beautiful Arbor Hills nature preserve, and our quiet setting seem to attract an incredible amount of wildlife that is so much fun to watch! The streams, the parks, the lake, and most importantly our friendly neighbors really make Cypress Point a special place to live. The guard gate amenity helps not only reduce traffic on our streets, but also helps to provide a quiet environment. It's doubtful the extensive shopping and dining opportunities that are within minutes of Cypress Point can be matched anywhere else in town...or possibly in the entire metroplex for that matter! The Cypress Point HOA is a neighborly community where we watch out for one another's homes, walk our dogs, and joyfully watch our children enjoy playing in the front yards. Please feel free to contact us if you'd like more information about our neighborhood! 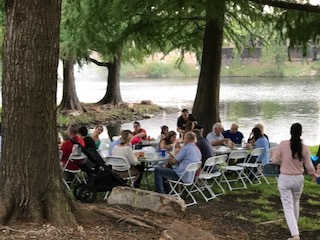 Over 65 people got together for our National Night Out social and had a nice evening together down by the lake. 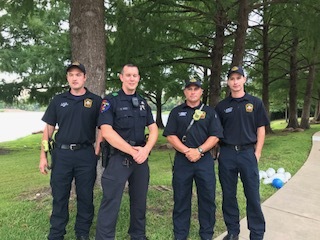 Burgers, hot dogs and outstanding ice cream were enjoyed along with some comradery and a visit from our local fire and police teams. The kids enjoyed a balloon artist and glitter paint as well a tour of a fire truck. Over the past several months overnight parking has become a problem as it had in the past; however, once residents were reminded of Article 7.19 in our CPHOA Declaration, our community has 100% compliance. It is important that each resident be cognizant of, and abides by, the appropriate covenants. The problem and complaints have not been about the occasional guest or visitor parking overnight for a short period of time, or for social functions; everyone understands these conditions. The problem has been residents or frequent or long-term guests/family members continually parking in the streets on a daily and/or nightly basis (i.e. using community streets for personal parking spaces). Overnight parking is the problem and is not acceptable. If absolutely necessary, automobiles or SUV’s may be parked in the entryway to garages, as long as they do not protrude into the alley or onto a sidewalk. Article 10.11 of the Declaration addresses the imposition of violation fines. The Board of Directors has been reluctant to do so in the past for parking violations and does not desire to now; however, such will be implemented for those failing to remedy the situation in an expeditious manner or who continually persist with violations. Please be a good neighbor and observe these parking by-laws. Various members have homes for the sale and the parking of automobiles or other vehicles on community streets can only have a detrimental impact. Likewise, such present security issues at night. The aesthetics of Cypress Point is important to us all. Please pass along anything that affects our neighborhood that you want the board to know about. Broken equipment, things in need of maintenance, ideas to improve our community. You can call or email Officer Syed Hashmi at the Gate House - Bryce's hours are Monday through Friday from 8:00 a.m. to 4:00 p.m. Please make sure that Bryce is aware of any visitors that you want admitted. Please remember to drive slowly through the neighborhood. Out of respect for your neighbors and especially with school being out for the summer it is very imortant to watch your speed as you drive through the community. Please drive no more than 20 miles per hour within the Associaiton. If you see a vender vehicle speeding through the community, please feel free to contact SBB Management at 972-960-2800, ext. 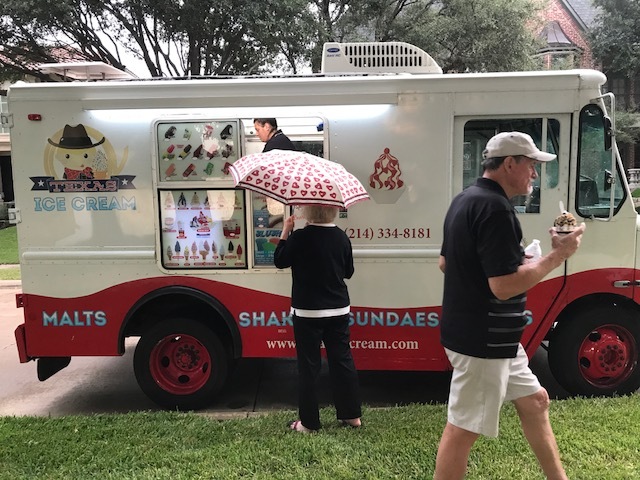 379 or 397 and report the name of the company of the vendor with a description of the vehicle, license plate number and date and time of the incident. Once SBB Management has this information they will do their best to contact the vendor company to address the issue. For Sale brochure containers are available to the residents of Cypress Point. They are located on the For Sale sign beside the guardhouse.